They came with their gadgets, their gizmos, and devices. They used algorithms, calculations, and scientific exercises. 226 teams from a dozen schools in three colleges showcased their projects at the 2018 Spring Capstone Design Expo, and while they all hoped to take home an award, the fact that they made it that far was an accomplishment in itself. Senior Design is a required course for many majors, and Capstone represents the culmination of months of work for the seniors who participated. For some students the projects could turn into stepping stones for launching startups. 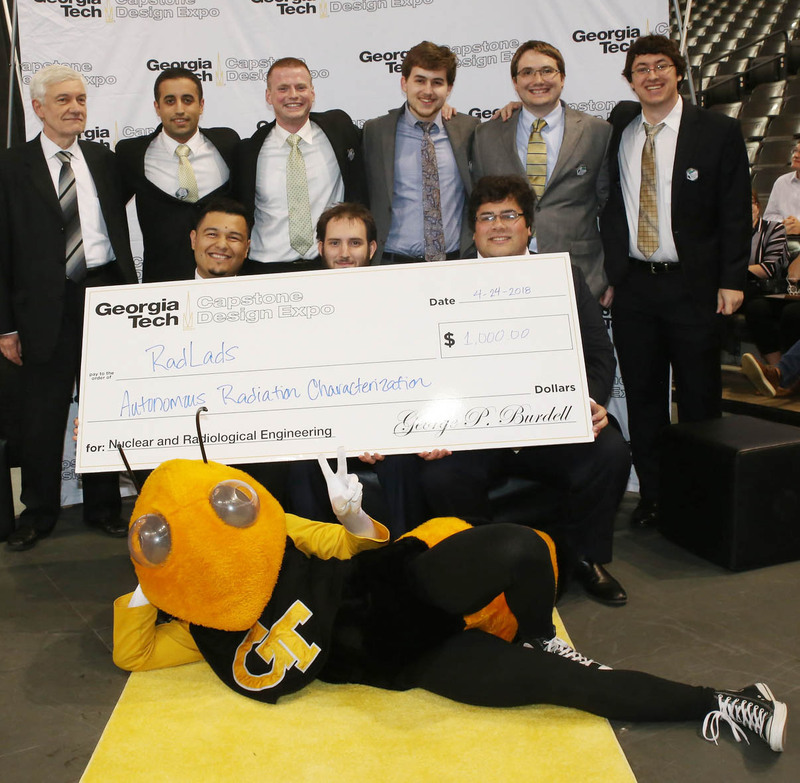 Several teams were presented with golden tickets, granting them entry into Georgia Tech's CREATE-X startup program. Others students used their projects to wow sponsors, earning them jobs, continued funding to follow up on their work, or in the very least, an important industry collaboration to put on their resume. For all teams, the night was a reminder of what Georgia Tech students can accomplish when they put their minds to something. For example, the winning ISyE team worked with FedEx to optimize their linehaul truck fleet. By the team's calculations, adopting their plan will save FedEx more than $200,000 per week. The award-winning civil engineering team discovered that by changing the lane striping at the I-285 and I-20 junction on the west side of Atlanta, bottlenecks can be eliminated and flow improved for miles in every direction, shaving up to 10 minutes off of commute times. Team pHAM, from materials science and engineering, developed a filter that reduces the acidity of coffee, thereby negating some of the negative effects of drinking it, such as acid reflux and enamel damage. The un-sponsored squad took home the People's Choice Award at this year's InVenture Prize competition and is working on commercializing their product. The team members who took home Capstone's best overall project award are hoping it opens some doors for them as they approach graduation and look for jobs. Team Kit Cath, made up of biomedical engineering majors Kathleen Jordan, Lemou Tieyam, Diana Yunda, and Alexa Schlein developed an adaptable catheter for their sponsors in the Interventional Radiology Department at Emory University Hospital Midtown. Inspired by a Slinky, the catheter tip can bend and adjust to the curves in a patient's vascular system, resulting in a snug fit and greatly reducing the amount of time radiologists have to spend adjusting catheters. It will also reduce the number of catheter exchanges, wasted product, procedure lengths, costs, and patient discomfort. Everyone on the team is interested in pursing careers in the medical device field. Looking back on their experience, team member Alexa Schlein commented that there were plenty of ups and owns in the process, but overall they enjoyed it. "Prototyping is so much fun," said Schlein. "You get to build stuff that doesn't work and then figure out how to fix it. We were constantly fixing things. We had some terrible designs for the handle and it broke a lot. That was the biggest challenge." Schlein also offered a lesson to next year's Capstone participants, and Georgia Tech students in general- "Never underestimate the amount of effort you're going to need to put into something. We scrambled right up until the end, and even though we were happy with the outcome we know we could have come up with a better prototype if we put in more effort earlier on." Check the results below to see who was able to turn their effort into awards.